Bridgeport, CT -- The Bridgeport Arcade Mall and CreateHereNow, an innovative program focusing on space reuse and creative enterprise development, launch their summer workshop and event series inviting you to join in on the activity Thursday, June 20th from 5-8pm for "Etsy's Craft Party: Craft for Community Event", hosted by Made in Bridgeport located at The Arcade Mall, 1001 Main Street, Bridgeport. CreateHereNow Bridgeport, in collaboration with POKO Partners LLC, is proud to support this event as it strives to make "vacant into vibrant" by bringing innovative businesses to the historic site. "Bridgeport's artists and small business owners have been one of the driving forces of the success of our downtown neighborhood," said Mayor Finch. "Thanks to the efforts of the CreateHereNow program, the historic Arcade building will be alive with creative businesses and entrepreneurs." The goal is to fill the Arcade with bustling community activity once again by transforming this historic retail space into a creative collective. One way CreateHereNow has been activating the empty Arcade spaces is with unique workshops presented by Made In Bridgeport and related partners. After years of vending opportunities at craft fairs, festivals and a recent New Haven pop-up shop, Made In Bridgeport's artist and educator Robin Gilmore opened her establishment at The Arcade Mall earlier this month. Her merchandise includes upcycled industrial, vintage and urban jewelry/artifacts. Their full calendar of workshops is listed below. On June 20th, The Arcade will be buzzing with creative activity once again as Made in Bridgeport is hosting Etsy's Craft Party: Craft for Community Event. Etsy (www.etsy.com), hosts a global "Craft Party" yearly to encourage local groups of Etsy Vendors to meet up, create, craft together, share their connections and bond with one another. The Bridgeport event theme "People make the World Go 'Round" will be facilitated by Etsy sellers and local craft artists and is an open invitation to the general public. The crafting projects and workshops each have a small suggested donation with proceeds going to local non-profit organizations in the Bridgeport community. Made In Bridgeport, www.madeinbridgeport.weebly.com, offering a workshop for $15 to make 2 pairs of earrings- Keep a pair for yourself and donate a pair to the Kennedy Center's Nearly New Thrift Shop with proceeds to support the Kennedy Center Community Services Programs. I Adore Life Handmade, www.etsy.com/shop/iadorelifehandmade, will be facilitating a jewelry wrapping workshop: Make a ring for $15 with proceeds benefiting the Bridgeport Community Gardens. Wisteria Studios, www.etsy.com/shop/WisteriaStudios or www.susanernst.blogspot.com, will be facilitating a workshop to create decorative papers and books in the shapes of Circles. Donations $15 per class with two classes offered. Proceeds to support Hall Neighborhood House Literacy Program www.hnhonline.org. Paradox Ink, www.etsy.com/shop/paradoxink, will be creating silkscreened Tees for an embroidery workshop. $20-$25 Shirts will be donated to the Center for Women and Families of Eastern Fairfield County. Crafting will take place in various locations throughout The Arcade Mall, at Made in Bridgeport, Paradox Ink, and the World Artist Network and the list is continuing to grow with even more activities! Stop in and see what's being made and learn something new and crafty while supporting your local community. Pre-registration is recommended as there is limited space and only 100 tickets available. Participants are kindly asked to bring a non-perishable food item to support Alpha Community Services ( www.cccymca.org/locations/alpha ) to be collected at the time of check in. Create Wort the Bluebird of Happiness. CreateHereNow Connecticut is a space reuse pilot program launching in Bridgeport, CT. The primary goal of this project is to activate vacant locations by transforming them into innovative small businesses in the Downtown area. The CreateHereNow Connecticut program will generate sustainable placemaking initiatives in 20 municipalities throughout CT. Bridgeport is the home of our first pilot program focusing on space reuse and small business development, turning vacant into vibrant. 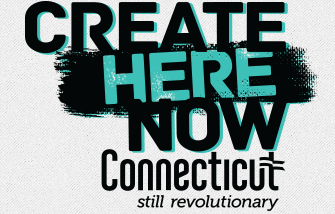 CreateHereNow Bridgeport is collaboration between the State of Connecticut Department of Economic and Community Development (DECD), The Downtown Special Services District (DSSD), The City of Bridgeport, and The Cultural Alliance of Fairfield County (CAFC).